The scientific basis of the ability of dogs to detect the odour of cancer is believed to be linked to volatile organic compounds produced by malignant cells. It has been established that during tumour growth changes occur in some of the cellular proteins, leading to peroxidation of the cell membrane components, which then produces volatile organic compounds that can be detected in the headspace of the cells. There is strong indication from a number of studies that these cancer volatiles are excreted in urine or exhaled on the breath at an early stage in the disease process. The first clinically robust investigation of cancer detection by dogs was reported by Willis and colleagues (British Medical Journal 2004). During this study, dogs were trained by individuals from Medical Detection Dogs (aka Cancer and Bio-detection Dogs) to detect bladder cancer (transitional cell carcinoma) by smelling urine samples from patients and healthy controls. Six dogs of varying breeds were used, none of which had been trained for previous scent work. Overall diagnostic accuracy was 41% (compared with the 14% success rate expected from chance alone). However there was considerable variation in the success rate between dogs, the best dog achieving 56%, but two dogs having no success at all. The charity, in collaboration with Willis et al, published a further study in The Journal of Cancer Biomarkers 2011, ‘Volatile organic compounds as biomarkers of bladder cancer: Sensitivity and specificity using trained sniffer dogs’. Specificity ranged from 92% for urine samples obtained from young, healthy volunteers, decreasing to 56% for samples taken from older patients with non-cancerous urological disease. Supporting evidence has been published around the world including a study by Cornu and colleagues (European Urology 2011), ‘Olfactory Detection of Prostate Cancer by Dogs Sniffing Urine: A Step Forward in Early Diagnosis’, indicated the possibilities of canine cancer detection (sensitivity 91%, specificity 91%). A second study published online in 2011 by Sonoda and colleagues investigated colorectal cancer screening using faecal samples, and demonstrated equally promising results (sensitivity 97%, specificity 99%). A recent study from Italy (Taverna et al, Journal of Urology 2014), reported the diagnostic accuracy of dogs trained to recognise specific volatile organic compounds of prostate cancer in urine samples (sensitivity 98–100%; specificity 98–99%). Ehmann et al (European Respiratory Journal, 2012) carried out the first published study showing that sniffer dogs can reliably detect lung cancer from a breath sample (sensitivity 71% specificity 93%). Church J, Williams H. et al. Another sniffer dog for the clinic? Lancet 2001,Sept. 15;358:930. Concha, A., Mills, D.S., Feugier, A., Zulch, H., Guest, C., Harris, R., Pike, T.W. (2014). Using Sniffing Behavior to Differentiate True Negative from False Negative Responses in Trained Scent-Detection Dogs. Chemical Senses,Sept. 2014. Currie CJ, et al. Evaluation of the impact of hypoglycaemia on health care resource use, productivity, fear of hypoglycaemia and health utility in a UK population. Diabetologica 2004,47 : A323 2004. Mancini, C., Harris, R., Aengenheister, B., Guest, C. (2015). Re-Centering Multispecies Practices: a Canine Interface for Cancer Detection Dogs, 33rd International ACM CHI Conference on Human Factors in Computing Systems, ACM CHI’15, ACM Press, pp. 2673-2682. Taverna G, Tidu L, Grizzi F, et al. Olfactory System of Highly Trained Dogs Detects Prostate Cancer in Urine Samples. 2014, Sep 28. pii: S0022-5347(14)04573-X. doi: 10.1016/j.juro.2014.09.099. Waggoner LP, Jones M, Williams M, et al. Effects of extraneous odors on canine detection. Enforcement and Securities Technologies, Proc. SPIE, 1998 vol. 3575, 355-62. Wells DL, Lawson SW, Siriwardena AN. Canine Responses to Hypoglycaemia in Patients with Type 1 DiabetesJournal of Alternative and Complementary Medicine 2008, 14 (10 ): 1235-1241. Willis CM, Church SM, Guest CM, et al: Olfactory detection of human bladder cancer by dogs: proof of principle study. British Medical Journal 2004, 329: 712-714. Willis CM, Britton LE, Harris R, Wallace J, Guest CM. Volatile organic compounds as biomarkers of bladder cancer: Sensitivity and specificity using trained sniffer dogs. Cancer Biomark. 2010/11; 8: 145-53. Evidence-based research is building to indicate that dogs could assist in improving current diagnosis of a significant number of cancers. Nano-technologists have already used this research to develop prototypes of electronic noses. In Israel, in a joint venture between the Technion-Israel Institute of Technology and Alpha Szenszor, The ™NA-NOSE, sensor was developed. The ™Na-Nose explicitly sought to duplicate the dogs experience with technology following the results of the BMJ paper in 2004. This sensor is able to detect lung cancer through exhaled breath. The Odoreader® from Bristol Urological Institute and Liverpool University is a direct result of the BMJ paper in 2004 and is able to help detect and diagnose early stage bladder cancer. Sensitivity relates to the ability of the test to correctly identify a positive result, i.e. sick people correctly identified as being sick. Specificity relates to the ability of the test to correctly identify negative results, i.e. people without the disease correctly identified as being without the disease. Figures 1 and 2 (below) illustrate unpublished training data for the correct detection of bladder cancer samples and non-bladder cancer samples by Cancer Detection Dog Daisy. The bar charts refer to test samples that were used for training purposes, including non-blinded, single-blinded and double-blinded runs. Many of these samples were shown to the dog on more than one occasion, to enable the dog to learn to detect a particular scent. The accuracy rate for an individual dog may be much lower in a true test situation, i.e. when the dog is trying to detect previously undiagnosed samples of cancer. The blue bar represents samples that were correctly indicated by the dog as positive cancer samples (551/594). 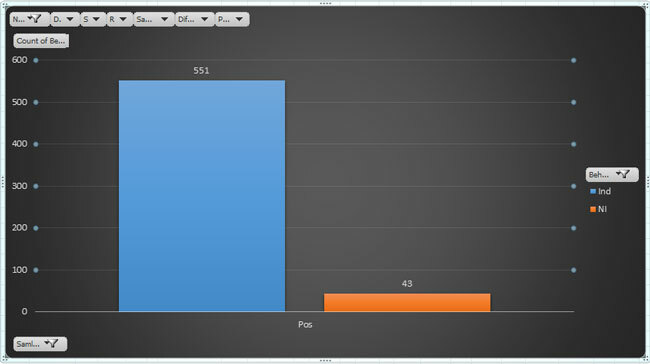 The orange bar represents positive cancer samples that were not indicated by the dog in error (i.e. did have the disease but were not indicated by the dog as having the disease; 43/594). 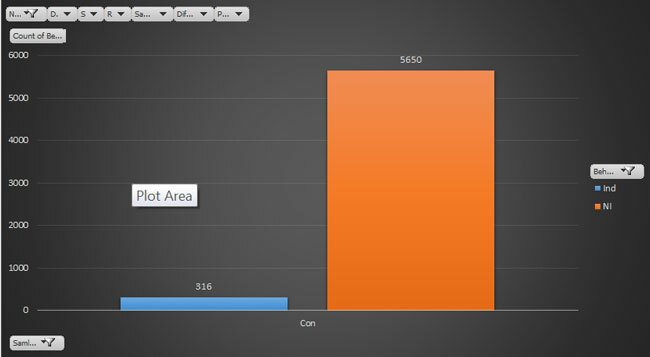 The orange bar represents samples that were correctly ignored by the dog (i.e. did not have the disease; 5650/5966). The blue bar represents samples that were indicated as being positive by the dog in error (i.e. did not have the disease but were indicated by the dog as having the disease; 316/5966). This training data corresponds with the publications mentioned earlier. 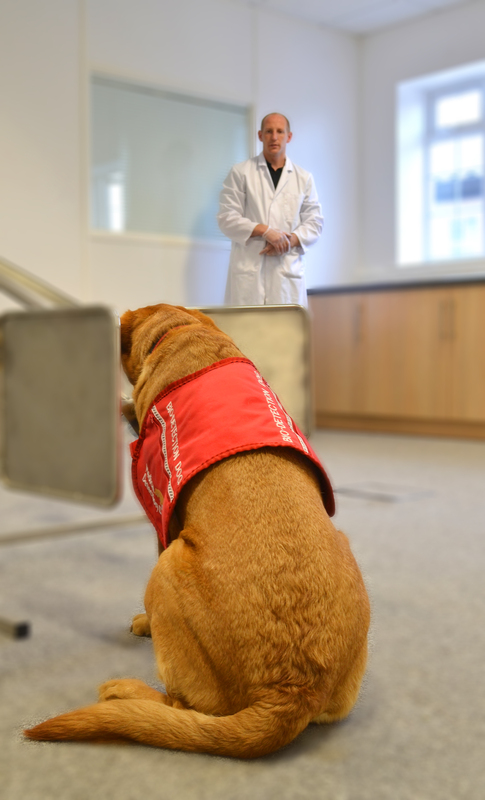 Medical Detection Dogs are now embarking on further studies with much larger, and double-blind, samples to determine current accuracy, for which we will seek peer review. Our experience since the first study in 2004 has enabled us to refine training methods and consequently improve success rates with a number of dogs. Dogs with their incredible sense of smell can detect the minute odours now understood to be associated with many cancers. As yet we do not know exactly what it is the dogs can smell because they cannot tell us what markers they are sensing. 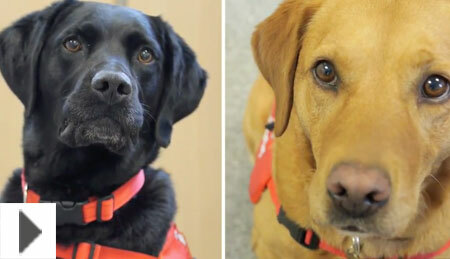 Medical Detection Dogs is accepting funding applications from collaborators looking to explore the potential of animals to detect human disease through odour to improve diagnosis for the patient and support improvement in the management of long-term health conditions. 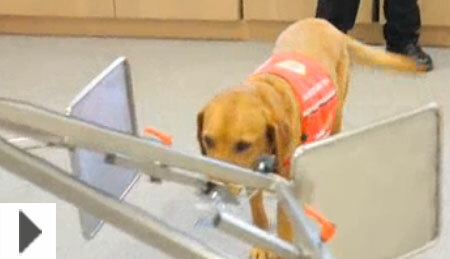 Please email rob.harris@medicaldetectiondogs.org.uk in the first instance to request an initial application form.